“Better than I expected.” is the note I put on this recipe when I made it AFTER everybody else. Two of our group liked it. One, not so much. I knew I had to go back and try it. I am so glad I did. Like Kayte said, the flavor grows on you. I really did not expect to like this one at all. But it was delicious. Very refreshing. 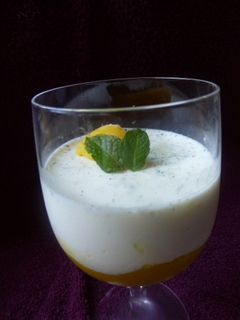 All those litle green bits of basil floating in a creamy, icy cold sorbet. Delish! This is one of those desserts I have been wanting to make but just haven’t. No reason. I see recipes all the time but just never have followed through. Imagine how excited I was to see if on the August list for Baking Chez Moi/Tuesdays with Dorie. FINALLY!!! 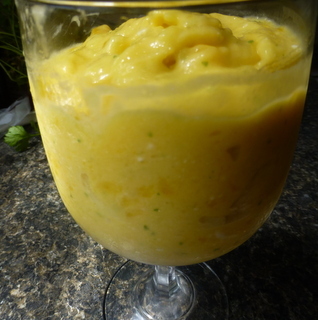 This one, and there are a couple of more, is made with mango as the base. And it is lovely when it is all put together. 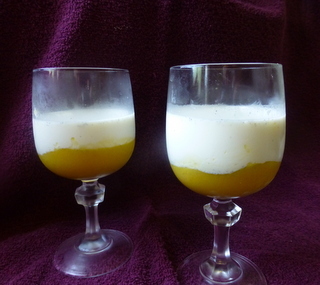 Full of the sweet/tart taste of the mango puree on the bottom and the sweet vanilla panna cotta on top. I can see this with lots of other variations – blueberry, strawberry, lemon. The recipe is on page 270 of Dorie Greenspan’s Baking Chez Moi. We don’t print the recipes but if you buy her book you can join in the baking! And check with the other Doristas for their Panna Cottas. I am sure there will be some lovely variations.